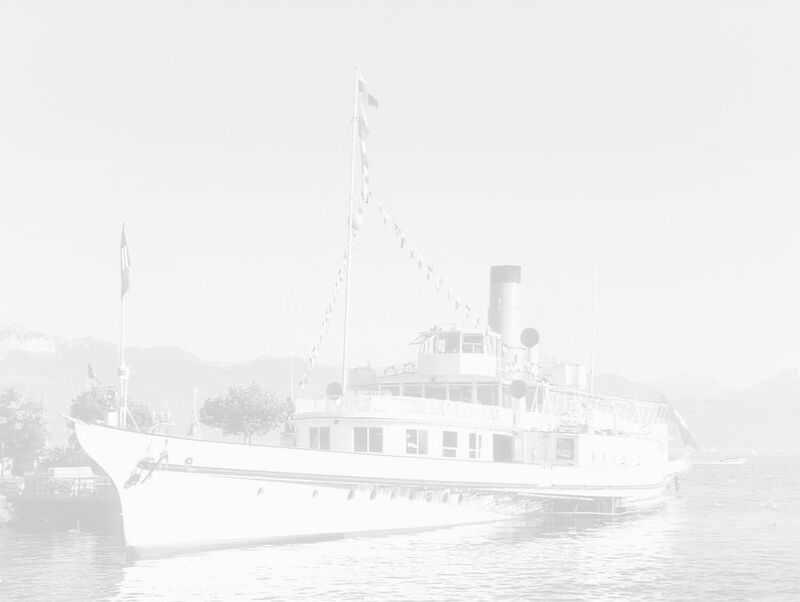 This page is devoted to postcards and photographs of the Fred Olsen ship Christian IV. Christian IV was built by Aalborgs Vaerft A/S, Ålborg, Denmark in 1967 for A/S Kristiansands Dampskipsselskap, Kristiansand, Norway. 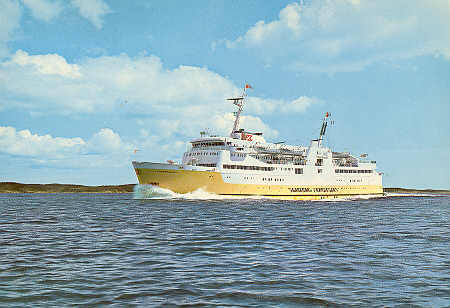 Christian IV entered service between Kristiansand-Hirtshals in 1968. Soon afterwards, Fred Olsen acquired a majority ownership in Kristiansands DS. Christian IV was sold in 1984 to Malaysian owners Perbadanan National Shipping Line Berhad, Kuala Lumpur, and renamed Pernas Safari. In 1994 Pernas Safari was sold to Endeavour Shipping SA, Valletta, Malta as the Safari and used on a service as Safari Lines betwen Bari-Korfu-Igoumenitsa. 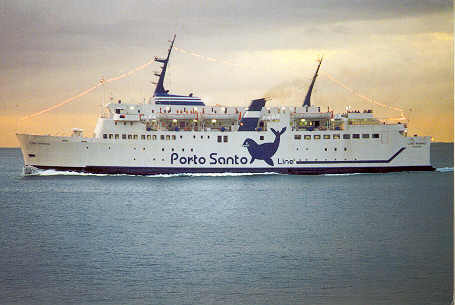 In 1996 Safari was bought by Porto Santo Line, Madeira, renamed the Lobo Marinho and put into service between Vila Baleira, Porto Santo and Funchal, Madeira. 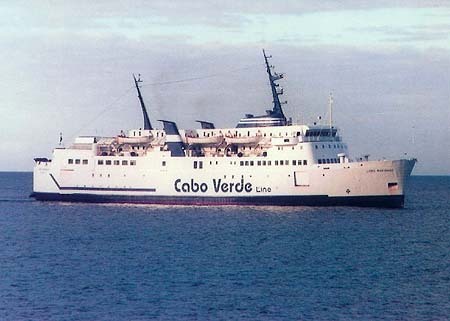 Lobo Marinho was replaced by a new built ship of the same name in 2003, and was sold to Cabo Verde Line, Praia, Cape Verde Islands, and renamed Lobo des Mares for a service between Mindelo and the island of Praia (one return trip per week). Christian IV was built by Aalborgs Vaerft A/S, Ålborg, Denmark in 1967 for A/S Kristiansands Dampskipsselskap, Kristiansand, Norway. 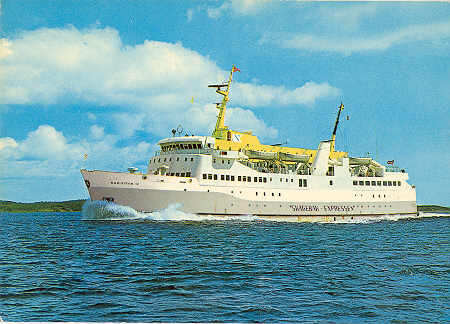 She entered service between Kristiansand-Hirtshals in 1968. Soon afterwards, Fred Olsen acquired a majority ownership in Kristiansands DS. Kristiansands DS postcard of Christian IV. Christian IV was built by Aalborgs Vaerft A/S, Ålborg, Denmark in 1967 for A/S Kristiansands Dampskipsselskap, Kristiansand, Norway. She entered service between Kristiansand-Hirtshals in 1968. Soon afterwards, Fred Olsen acquired a majority ownership in Kristiansands DS. Christian IV was sold in 1984 to Malaysian owners Perbadanan National Shipping Line Berhad, Kuala Lumpur, and renamed Pernas Safari. Fred Olsen postcard of Christian IV. Christian IV was sold in 1984 to Malaysian owners Perbadanan National Shipping Line Berhad, Kuala Lumpur, and renamed Pernas Safari. In 1994 she was sold to Endeavour Shipping SA, Valletta, Malta as the Safari and used on a service as Safari Lines betwen Bari-Korfu-Igoumenitsa. I do not have images yet of Pernas Safari. Christian IV was sold in 1984 to Malaysian owners Perbadanan National Shipping Line Berhad, Kuala Lumpur, and renamed Pernas Safari. In 1994 she was sold to Endeavour Shipping SA, Valletta, Malta as the Safari and used on a service as Safari Lines betwen Bari-Korfu-Igoumenitsa. In 1996 Safari was bought by Porto Santo Line, Madeira, renamed the Lobo Marinho and put into service between Vila Baleira, Porto Santo and Funchal, Madeira. She was replaced by a new built ship in 2003, and was sold to Cabo Verde Line, Praia, Cape Verde Islands, and renamed Lobo des Mares for a service between Mindelo and the island of Praia (one return trip per week). 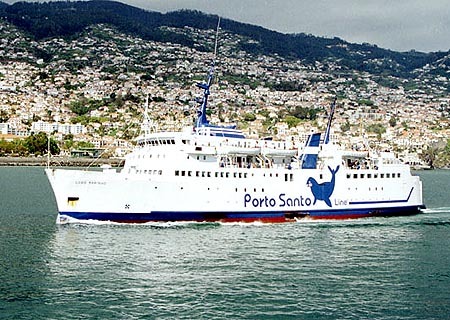 In 1996 Safari was bought by Porto Santo Line, Madeira, renamed the Lobo Marinho and put into service between Vila Baleira, Porto Santo and Funchal, Madeira. She was replaced by a new built ship in 2003, having been briefly renamed Lobo Marinho I, and was sold to Cabo Verde Line, Praia, Cape Verde Islands, who renamed her Lobo des Mares for a service between Mindelo and the island of Praia (one return trip per week). 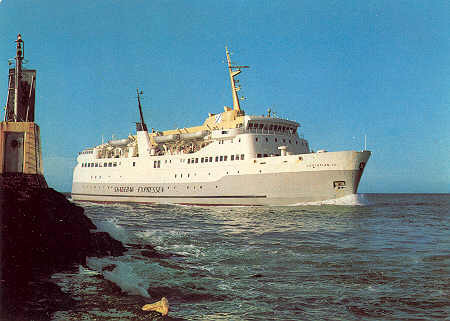 Porto Santo Line postcard of Lobo Marinho. Lobo Marinho was replaced by a new built ship in 2003, and was briefly renamed Lobo Marinho I. She was sold to Cabo Verde Line, Praia, Cape Verde Islands, and renamed Lobo des Mares for a service between Mindelo and the island of Praia (one return trip per week). Lobo Marinho I being delivered to Cabo Verde Line - she was renamed Lobo des Mares on arrival. I do not have images yet of Lobo des Mares in Cape Verde service.